Select your nearest depot for a instant online quote. Why choose Tow My Car Towing Services? With a large fleet of towing contractors located all over Australia, you can be sure that waiting times are kept to a minimum. 8 out of 10 customers would recommend Tow My Car to friends or family. Over 20 insurance companies use us as their preferred vehicle towing service. On average we assist over 600 motorists every month. Unfortunately unplanned breakdowns can happen to even the most well maintained vehicle. So whether your stuck on the side of the road, in the carpark or in the driveway. Don't stress just select your nearest Tow My Car depot to get a instant quote online and to book your towing job. Just purchased a vehicle at Auction? No plates? No Rego? No Worries! Tow My Car regularly tow's vehicles from all the major Auction yards including Grays online, Pickles Auctions and Manheim Auctions. In most cases you won't even need to be present at the auction site for the pickup. So get a Instant Quote online and Book your Towing Service Today. At Tow My Car we not only tow vehicles, we can tow your light machinery as well. So if you need to tow a Tractor to the farm or tow a Bobcat to the jobsite. Call Tow My Car today for all your light machinery towing needs. note. 3 Tonne maximum towing capacity applies. TOW MY CAR is your local towing service. Originally starting out in the Central Brisbane suburb of Coorparoo. We soon realised we had more work than we had Tow Trucks. Creating Australia's first online Towing Network we have grown to provide service coverage accross all major capital cities in Australia. Our Team of Contractors provide Towing to all suburbs in Brisbane, Sydney, Melbourne and Perth and travel upto 100km radius of each CBD. We are here to help, focusing on providing a fast response, affordable towing and a quality towing service. Our Network of Contractors are fully trained and qualified in towing running and non-running vehicles, including all types of Cars, Vans, Station Wagons, Four Wheel Drives. 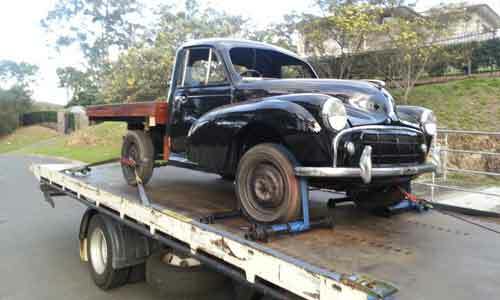 When you need a reliable Australia-Wide Towing Service we can tow your vehicle from your home, to the mechanic, from the Auction yards, or even from the roadside. So whether you are Broken down, require a door to door towing service, purchased a vehicle at auction try out our online Towing Quote Calculator to get a instant quote and to book your tow. Tow My Car will provide a Fast and Reliable service, Competitive Pricing and rest assured our Contractors are fully insured for your total piece of mind. To contact us please fill out the contact form below. The most common method used for loading wheeled and non-wheeled equipment is for the towing truck to be positioned in front of the equipment to be loaded. The tray is then tilted so that the back of the tray is at ground level. A winch rope is attached to the load using a sling or other means of attachment.The operator uses the hydraulic controls of the tow truck winch to draw the load on to the truck. When the load is completely supported by the tray of the tow truck the tilt tray is returned to the flat position and the load secured for towing and transport. In carrying out this operation there are a number of hazards present for the operator and people near the loading operation. In preserving the safety of the operator and others in the workplace, no one element of the operation is more important than any other. This means that operator training, selection of equipment, inspection, maintenance and adjustment of equipment must all be addressed to ensure the safety of people carrying out this work. General hazards: Any winch and associated controls used for pulling loads on to the tray of a tilt tray tow truck must be in good working order. A competent person should carry out regular inspection and maintenance. A record of any maintenance or repairs carried out on the winch should be maintained. The bolts used to hold the winch to the tow truck, and their location, must be in accordance with the manufacturer’s instructions. The method of securing the winch rope tow hook or other attachment to the winch tow rope and the method of attaching the winch tow rope to the winch drum must also be in accordance with the manufacturer’s instruction. Ideally, a swivel hook with a safety latch should be fitted to the winch rope. Winch ropes are easily damaged if load is put on a rope that is tangled on the drum. Devices are available which ensure the rope does not get tangled and such devices can be retro fitted to an existing winch. Further information can be obtained from the winch manufacturer. Winch operation: Ongoing supervision must be provided to ensure the operator carries out the loading task in accordance with approved procedures and does not change those procedures for easier but less safe procedures. Winch control location and position of operator Some positions can be safer than others and when installing or relocating controls consideration should be given to ensuring the operator is in the safest position. From a practical point of view there is no safe operator position when an attachment breaks. It is very important that every precaution is taken to prevent any item in the winching train (sling, attachment, winch rope etc) from breaking. Most winches can be fitted with remote controls. An inexperienced operator may carry the remote control and move into a position very close to the winch rope and chain slings, significantly increasing the risk to themselves. Selection of attachment equipment, winch ropes, towing hooks, slings and fittings must be selected, used and maintained to ensure the safe working load limit of any item is not exceeded by the maximum force exerted by the winch. A competent person would normally carry out hydraulic system adjustments. The simple solution is to limit the maximum force exerted by the winch through adjustment of the hydraulic system. The force exerted by the winch should be limited to the working load limit of any attachment device used to attach the load to the winch. There are a number of reasons for this including: • the operator has no way of knowing how much force they are putting on each individual part of the equipment during loading; • if the load is prevented from being drawn on to the tray of the tow truck the force exerted by the winch increases very quickly. The operator has almost no warning that the working load limit of attachment, slings or equipment has been exceeded and that the winch should be shut down immediately until the obstruction is removed; and • where the working-load-limit of chains and equipment is exceeded, the weakest point between the winch drum and the point of attachment to the load can fail with fatal consequences. Most hydraulic winches are capable of exerting a pull in excess of 15 tonnes. To provide attachment equipment capable of safely withstanding the maximum pull of the winch may be impracticable. The maximum pull required to carry out all normal tasks is usually much lower than can be delivered by a winch. Therefore, the pull of the winch should be limited to the maximum amount of pull required to carry out the heaviest task. If you would like to report a abandoned vehicle on a public road, footpath or park located in the Brisbane City Council area. You can report a abandoned vehicle here.